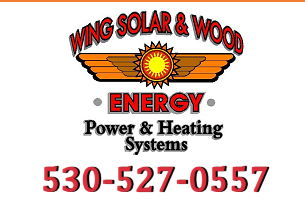 Since 1977, Wing Solar & Wood Energy, Inc. has been providing alternative energy solutions with superior design, installation and service to agricultural and commercial clients in Eureka, CA, and throughout Northern California. Whether your goal is to become independent of electric bills, supply back-up power for lighting, computer systems or heat, Wing Solar & Wood Energy, Inc. provides state of the art technology with the best customer service in the industry. Below you will find a summary of our commercial services in Eureka, CA. If you do not see what you are looking for just let us know, we will be happy to assist you. We can be contacted toll-free at 1-800-492-4061. Keeping a commercial property warm during the coldest months of the year can be a financial burden. The good news is that we offer comprehensive commercial solar heating services in Eureka and the surrounding area. This allows you to heat your property using the sustainable energy of the sun. Solar energy can be used to heat water for your commercial property in Eureka. We are happy to design a quality commercial solar water heating system to suit your needs. While solar water heaters are no longer the best option in most residences, they are still appropriate for many multi–family properties. If you are looking for an energy efficient alternative heating solution for your business in Eureka, consider installing hydronic heating with Wing Solar & Wood Energy, Inc. With numerous benefits including the flexibility of zoning, Hydronic radiant floor heating can be the most comfortable and efficient way to heat your business. If you are a commercial property owner in Eureka, CA, a forced draft system may be your solution to your alternative heating needs. With a forced draft system air is heated by a boiler or heat exchanger and circulated throughout the building through specially designed vents. This method is far more cost-effective for the larger organizations than traditional radiators and boilers. To learn more about our forced air systems please contact our office. A loss of power can be disastrous for business at any level. Wing Solar & Wood Energy, Inc. is proud to offer a variety of backup solutions to suit your needs and ensure you are ready for those unexpected moments. Our inverters/chargers by Outback provide clean, reliable backup power in the event of a power outage. They are also designed to work simultaneously with other larger battery banks and generators to provide longer backup times. Outback's inverter/chargers and charge controllers are highly compatible in a variety of commercial applications that include remote cell towers for telecommunications to long run time back up power for ATM's, kiosks, some pharmaceutical applications and much more. If you are in Eureka, CA, and have further questions or would like to schedule a consultation with our client care specialist, please contact Wing Solar & Wood Energy, Inc. toll-free at 1-800-492-4061. For your convenience, you may also request more information from this site.